3D Mapper Lite is a simple-to-use, low cost, desktop soft photogrammetry solution that enables users to quickly and efficiently create accurate 3D vector data from digital photography. Its use of the ScreenScope for 3D visualisation enables 3D Mapper Lite to run on an existing system that operates under Windows 95, 98 and NT without the need for expensive hardware upgrades. Download a free demo version of DDPS. This demo is fully functional, however, work cannot be saved. StereoMaker Lite: For the setting up of stereo models for use with StereoMapper Lite. Load and processes very large TIFF, BMP and DIB scanned photo image files, without compromising performance. Performs Interior (Affine or Conformal) orientation. Performs Exterior (Single Model Bundle Adjustment) orientation. Can perform Relative only orientation without the need for control points. Outputs Epipolar re-sampled images for use in StereoMapper. StereoMapper Lite: Provides accurate mapping and measurement in 3D, using stereo images. View and digitise features in 3D using the ScreenScope. 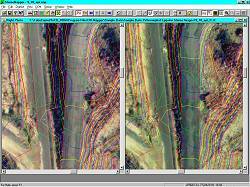 Generate Digital Elevation Models (DEM) from digitised features. Perform distance, area and volume calculations. ImageViewer: Designed to process and display very large images. Use ImageViewer to overlay DXF/DWG 3D vector data. Easy to use. The system is designed for use by non-photogrammetrist personnel. Requires about 15 minutes to master operation. 3D Mapper Lite does not contain the OrthoMaker module. Both Earth Curvature and Atmosphere Refraction corrections are not applied in the LITE version. The correction for the lens distortion may not be applied depending on the image size. If both the number of image rows and columns is less than 4000, then the lens distortion is corrected. Otherwise the lens distortion is not corrected. Some advanced features such as import orientation data from VirtuoZo and Match_AT, is not available. The number of points that can be digitised is limited to 3000. DWG export/export is NOT available, but the DXF import/export is included.